I recently saw an excellent movie called Hidden Figures, which highlighted the stories of three pioneering black women who worked at NASA in the 1960s. These women overcame prejudice and racial discrimination to find success in their chosen fields. The title of the movie is particularly compelling, because these women were too long “hidden” from history. Sadly, these historical oversights occur in sports as well. For example, many casual sports fans may know the stories of Jackie Robinson and Jesse Owens. These two African-American sports legends have had their life stories dramatized over the past couple of years in Hollywood movies such as 42 and Race. But while Robinson and Owens are amazing men who certainly deserve to have their achievements celebrated, some other equally terrific African-American sports trailblazers remain inexplicably “hidden” from mainstream recognition. Duke Slater is one of those men, and I have been on a mission for the past decade to bring his story to light. I was blessed to write the definitive biography of Duke Slater back in 2012, yet despite my best efforts, Slater is still a complete unknown to far too many sports fans. The good news is that if you haven’t heard about Duke Slater before, you’re in for a treat. He was an incredible man: a tremendous athlete, a pioneer, a scholar, and a gentleman. He was a trailblazer for African-Americans in the fields of football and law. Duke Slater was everything we want our athletes to be…exactly the kind of role model kids should look up to and adults would be wise to emulate. Over the next 28 days, in conjunction with Black History Month, I’m going to share 28 vignettes about the legend that was Duke Slater. My goal is to one day help the hidden story of Duke Slater remain hidden no more. And if you could share these articles and pass them around, I’d appreciate the help in publicizing his story. I’ll start this series by showing you one of the photos that made me so passionate about Duke Slater’s story. When I was researching my book on Duke, I came across this photo from 1962. 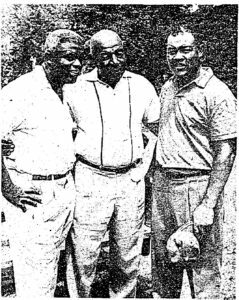 It’s a grainy, microfilm photo that shows what the Chicago Defender newspaper called three black greats in three different sports. Can you identify the three men in the photo below? The man in the middle, as you might expect, is Duke Slater. The man on the right (holding a hat) is a boxing legend, one who should be particularly familiar to folks from Detroit. Yes, that’s Joe Louis, one of the greatest heavyweight boxers that ever lived. Nicknamed the “Brown Bomber,” Louis is the namesake of Joe Louis Arena, the home of the NHL’s Detroit Red Wings. Moreover, the Monument to Joe Louis located in Hart Plaza – a fist punching south in opposition to racial injustice – is perhaps the most iconic symbol of the city of Detroit. The man on the left in the photo – with Slater’s right arm slung around his waist – has already been mentioned previously and needs no introduction to baseball fans. That’s Jackie Robinson, perhaps the most lauded African-American pioneer in sports. His impact and legacy in the game of baseball and beyond frankly need little elaboration here…sports fans and non-sports fans alike have almost certainly heard of Jackie Robinson and understand his importance in American society. That’s just sad. And wrong. And it needs to change. So let’s set about fixing that, shall we? Starting tomorrow, we’ll get to work on restoring Duke Slater to the pantheon of sports pioneers in this country, and then he can retake his proper place between Joe Louis and Jackie Robinson in the country’s sports consciousness. Read all about the incredible life of Duke Slater in his definitive biography, available here!